Last week, as we were chanting and bowing during a Fusatsu (atonement) ceremony, I was suddenly struck by a strong sense of beauty. Everything seemed to happen at the right time, in the right place, with the right group of people. It was as if the whole room were bowing and chanting with us – the altar, the statues, the candles, the walls, the calligraphies, the tatami mats, and the bells. Even the trees I could see through the windows seemed to be tuning in very happily. If we ever needed a reason for setting up a temple, here it was. Of course, temples are primarily places to practise. In order to practise, we just need some kind of accommodation. In the old days we were an itinerant sangha, travelling from one place to another, setting up zendos here, there, and everywhere. One of my most cherished locations was Hatch Point in the desert of Southern Utah. We would camp there and sit zazen outside on a flat piece of rock overlooking the Colorado Canyon. The view was stunning. Arranging mats in a broad half-circle and setting up a dried-up tree trunk as an altar was enough to create a perfect temple. But weather conditions are harsh down there, and we could do this only at certain times of the year. Moreover, at some point the well that provided us with fresh water dried up. I started dreaming of a Hatch Point Temple with all the amenities and one of our members, who was an architect, designed an adobe structure that would suit us perfectly. But it really was dream, because no building was permitted on that spot. Over time it became obvious that we needed a place to get rooted, and a property where we could welcome people at any time. So, I am very happy that we found this beautiful building in the north of Groningen, now almost sixteen years ago. Zen River Temple is a small pioneering monastery, but we’ve been renovating and expanding it, and meanwhile collected most of the traditional props and paraphernalia that are standard for running a Zen Buddhist practice programme. Moreover, as we got immersed in all the different aspects of the project, it became obvious that a temple is much more than accommodation. A temple gives us something to do. It allows us to combine efforts and follow a shared vision. Sitting meditation is the core of Zen practice and is indispensable. But by itself it is often not enough to enable us really to get to know ourselves. We need others as a mirror – not only a teacher but also fellow students. By living and working together, we discover things about others and – most importantly – about ourselves that otherwise might stay hidden. Imagine you get acquainted with someone over the internet and you enjoy countless Skype conversations. Perhaps you feel like you have found your true love or your best friend – until you go on a holiday together for two weeks! Because a sangha is a group of people that come together with a common purpose, it is easier to overcome personal differences. We start to recognize not only our own potential and limitations but also that of others. You may really dislike somebody – but perhaps that person is a very focused cleaner and you very much appreciate having a shining toilet! Or you may find out that your communication skills need a serious update but that your ability as a handyman or handywoman finds lots of appreciation. Our sangha is a collection of very different characters, each with his or her own personal quirks, and yet we seem to have managed well together for so many years. As a voluntary group, we can’t really select those who join. So, we just have to learn how to deal with one another, and by doing so we learn a great deal about ourselves. Dogen Zenji talks about studying the self, and then forgetting the self. Clearly, it must be in that order: we can only forget something that we first know. Working closely together is a priceless asset in this respect. Besides providing accommodation and a common purpose to work on, I feel that there are even deeper implications regarding the value of temples. As our practice brings about certain changes within us, the world around us start to change as well: it becomes imbued with a certain energy that is very mysterious and highly attractive. We start to treat things with more attention and care – whether it is the altars, the sitting cushions, the kitchen utensils, the coffee cups, the dining tables, or the garden paths and flower beds – and they all start to radiate similar energy back to whomever has a mind open enough to notice. When somebody regularly mops the floor with love, that floor will at some point respond with love, and welcome people who walk over it with a quiet smile. When the Chinese master Dayuan visited Zen River with some fifty of his followers they noticeably picked up on the atmosphere. 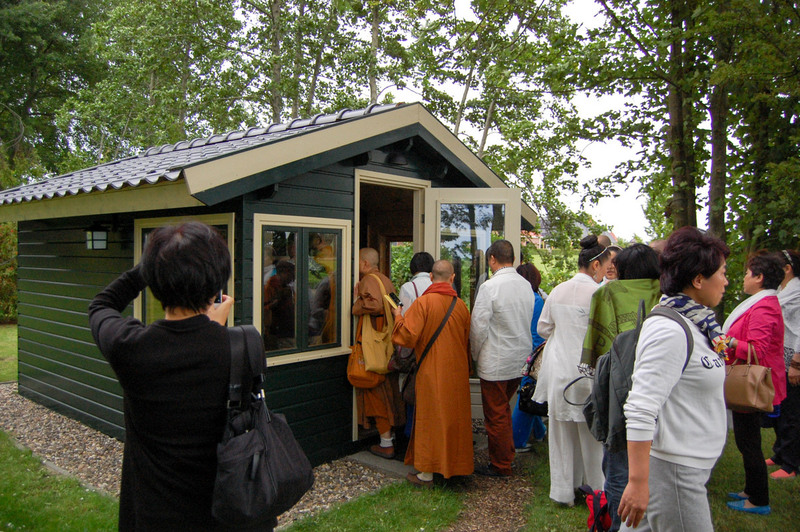 After seeing the zendo, Master Dayuan turned his attention to the Kobaian (dokusan hut) and half of the group joined him in investigating this humble structure. They all flocked around and tried to squeeze in, which of course didn’t work. I still wonder what they saw. The Kobaian is basically a garden shed and compared to their grand Liuzu Temple buildings in Hangzhou it must have looked somewhat pathetic. Yet it really inspired them, and an international connection was sealed. The Dharma has no fixed form, but that doesn’t mean that forms don’t matter. They are the very material we need to work with. To return to Fusatsu, as we follow an ancient script of bowing and chanting in a conducive environment, it becomes easier to forget ourselves and be in tune with the buddhas and ancestors throughout all times –because that is, after all, what we essentially are. So, we recognize ourselves in a different manner, we recognize others in a different manner, and we recognize this place and this moment in time in a different manner. Everything transforms, and this is not only an inspiration for us but for anybody who wishes to join. Zen River is truly an inspiring and supportive place to practice, and gratitude wells up just reading this piece. Having been able to practice there for several years, all tolled, the temple has become internalized to some extent. Each of the “nomadic” locations, too, were incredibly strong, and they remain mysteriously present years later. It seems that by practicing together and calling on the buddhas and bodhisattvas for their presence and assistance, an indelible container for practice has been forged in the heart.